All our Artwork in preparing your existing Company logo or preparing a new Company Logo for you is all done HERE in our premises. If you require any type of artwork there is no need to panic we do ALL the hard work for you. In one place you can get the right advice and quality logo prepared for you. We listen to your needs take your thoughts and convert them into quality designs for you our special client. 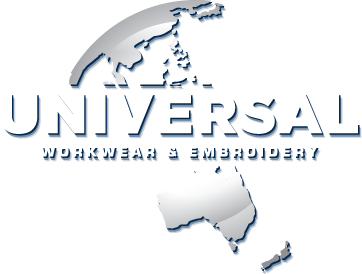 Embroidery is the professional way to enhance your business logo or make a statement. Using Embroidery on your logo shows your clients that yes you are Professional at everything you do. It is long lasting and wears the test of time and enhances any garment. You can use Embroidery on Clothing, Hats, Bags, and Towels and lots more. 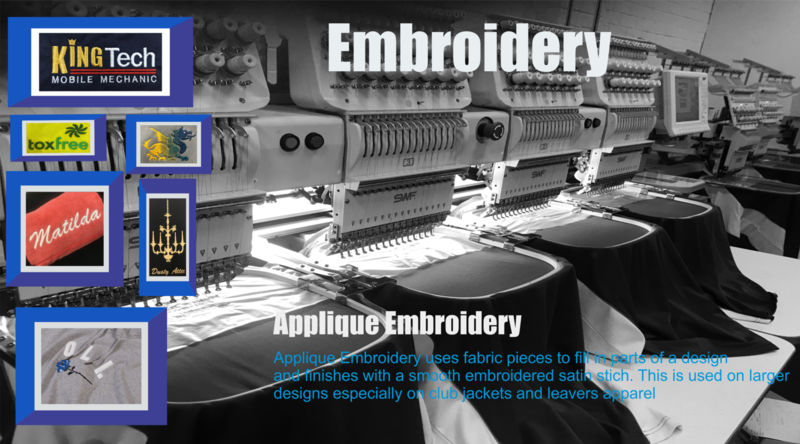 All our Embroidery is done in our Premises and therefore we oversee and make sure we are taking control off your requirement with first-class quality. We can design any type of logo, whether it is just text lettering to Full-Colour Pictures or Logos. All of our artwork is done in-house by our very own digitizer. All artwork is priced on the application and most only require a once off fee for your first order, your next order won’t incur these fees again and you will only need to pay for the Embroidery. The cost of Embroidery varies with every design. Contact us for your special price. Screen Printing is used for Larger Prints with Minimum quantity required is 20 Items. The process is used from 1 colour and up to 4 colour combinations and is pressed onto the fabric through fine mesh screens. This leaves the print on the garment surface. In most cases we Embroide the logo to the front Left Hand Side and Screen print the back of the garment, making your statement at low cost for Larger Quantities. Artwork, Screen, and Setups charges do apply for this application. For intricate detailed multi coloured logos or photo quality printing process look no further as we have all the latest and newest technology for this process. This process is becoming very popular which allows more detailed items to make that visual impact. Each design is printed in a high resolution transfer and is then heat transferred to the garment to give it that WOW FACTOR! Let us know your ideas and our Trained Staff will assist you with your needs and let you know what we can do for your special project. This system is used widely for short runs including 1 item. 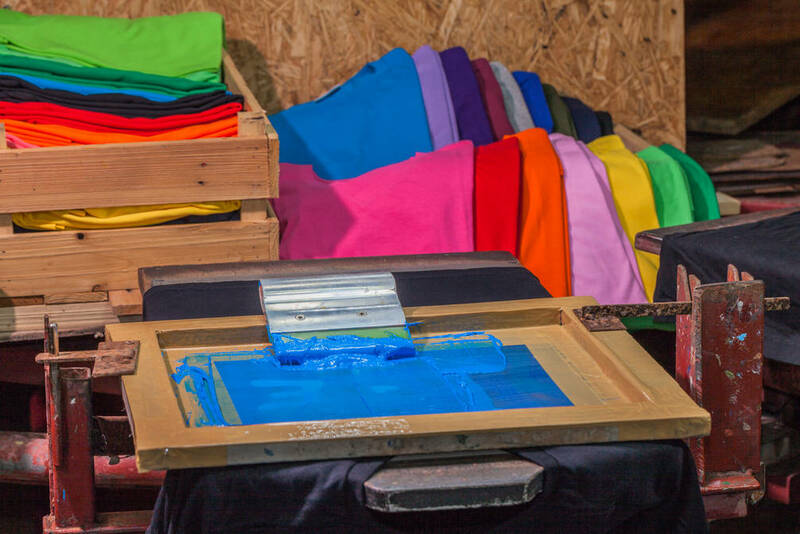 It is only a 1 colour process used on shirts jackets, and jumpers. The material is cut on our digital cutters and heat press applied to the garment. It can be used on a variety of materials and now is also available in a stretch material which is great for stretch sports fabric. Looks good when making a statement on shirts for Promos or Events like Hens, Bucks and Special Parties! Well Step in to the World of Sublimation and Let Us Colour your World. Anything from Text to Real Live pictures, Cars, Boats, Water Themes, Electricity, Checker Plates, Earth Scenery, these are just a few examples of what can be sublimated to a Shirt, Jacket or Stubby Holder. This process is specially made right here in Western Australia, (No imports) Let us help your Business, Sports Club or Corporation Shine above the rest with Sublimation. High quality images can be used for this application of print so be sure to talk to one of our Trained Staff about Sublimation for your next garments, you will Turn Heads! Minimum orders of 20 are required for this application for shirts or jackets and a minimum order of 50 for stubby holders. Being inspired? Contact us today to get the best price for your needs. © 2019 Universal Workwear. All rights reserved. Developed by Andy Vu.